For some time, in the technical mags like ASEAN Autobiz, I have been proposing that the all-electric car is getting closer. This would be a ‘plug-in’ where you just plug it into the mains grid to recharge overnight. The only problem stopping the universal adoption of this concept has been the batteries. Now remember when mobile phones first became available. The damn thing fitted into a suitcase, and you had to be Don Athaldo to be strong enough to carry it. Now the whole shooting match fits into your shirt pocket. Batteries are getting better and smaller. However, to store enough energy to propel a car has been the stumbling block, but that could be a thing of the past. Ultra-capacitor energy storage systems could be the answer. AFS Trinity has announced the real world performance specs of its plug-in Extreme Hybrid (XH) technology. In just completed road tests, a 2007 Saturn VUE Green Line SUV fitted with an XH drive train, exceeded 150 mpg (yes, that’s no misprint), and improved the zero to 100 kays time from 12.5 seconds, to 11.6 second running in electric-only mode - something it can do for 64 km at a stretch. The punchline is that in hybrid mode (petrol and electric), it runs 0-100 km/h in 6.9 seconds, which is faster than a Porsche Cayenne! In addition, based on driving 550 km a week, the company’s consumer payback analysis suggests the technology will pay for itself in less than four years - to make it the first economically viable, commercially-available hybrid auto technology. Up till now, you could never make enough savings to make a hybrid commercially viable. There were not enough savings, even with 60 mpg vehicles like Prius. 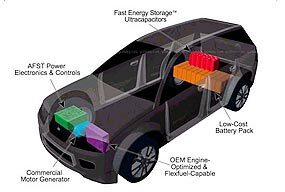 Extreme Hybrid technology in commercial production is expected to cost around $8,700 more than current, petrol-only SUV’s. The technology that made these results possible came from the former space and atomic energy scientists at AFS Trinity’s Livermore, California, laboratory with integration of the technology into the American SUVs made possible by respected global automotive engineering leader, Ricardo. “This has been a collaboration of rocket scientists and car guys,” Furia said. “They have taken the best from aerospace and computer science as well as automotive engineering to produce in a very short time frame and largely with off-the-shelf components a working vehicle prototype in which the XH plug-in hybrid drive train has been demonstrated in a family-size SUV. “The XH-150 does not require exotic or controversial fuels, it works within the present energy infrastructure, and components are available off-the-shelf at reasonable prices - prices that will only drop lower as volume demand increases. Just as important, XH production vehicles are capable of being built now at prices many people can afford. “At the heart of this new Fast Energy technology are patent pending control electronics to cache power for short periods in ultra-capacitors and provide this power in bursts for all-electric acceleration that is better, in many cases, than the internal combustion engine of the host vehicle,” Furia said. I firmly believe this will be the way of the future. Those people who think that hydrogen is the answer will have to work out how to get hydrogen to the mass market, and who is going to pay for the reticulation system. With plug-ins, the refueling system is as far away as the power point on the wall! Last week I asked what was the first air-cooled racing engine, which had a large fan to force air across the cylinders? Hint: do not jump to the first conclusion! So it was not a Porsche, but was in fact a 1906 Frayer-Miller. There’s nothing new under the sun! So to this week. Let’s have a rally question. Which team was disqualified from the Monte Carlo Rally for having a non-standard headlamp dipping system? This was after they had won! By the way, a couple of weeks back I asked about the first race on pneumatic tyres, and Will Kelsall from Cobra International commented that this was a cycle race in 1889. (John Boyd) Dunlop was a Scottish vet living in Belfast; he invented the pneumatic tyre, and persuaded cycle champion Willy Hume to use them in a race on the Queen’s College playing fields on 18 May 1889. He duly won the race and the tyres became de rigeur for all cycling. When they hit the motor race circuits I don’t know. Apparently (according to the BBC) another Scot, Robert Thompson had patented almost the same thing in 1845. This was not so popular due to the fact that there were no bicycles then ... it was used to make horse-drawn vehicles quieter and easier to pull. It worked OK but was rather expensive. Anyone for a brand new Jaguar XK 120 C type? When the XK 120 C type was new in 1951 it cost US$6000, twice the price of an XK120 road variant. A genuine, healthy C-Type will now set you back more than a million, and the 1953 Le Mans winner would be valued in excess of US$4 million. Replicas have been available from a variety of sources but few come with the heritage of Proteus which has been producing all aluminum bodied sports cars for two decades. Under new management, the company is looking for international distribution for its thoroughly authentic US$133,000 replica. The big news story in the world of specialist car production in the UK for 2007 was the takeover of Proteus Cars by rival sports car manufacturer Enduro Cars. With a complete management team changeover and location, the company is now producing the XK 120 C and planning production of a host of dream cars including a Light Weight E-Type, the C-Type Coupe, and a variety of period racing machinery such as the ERA Voiturette and some as-yet-unnamed early F1 cars. The company only builds fully finished aluminum cars carrying 60,000/5 year warranties and the current production is approximately 150 cars a year but output is being ramped up to meet the demands of the worldwide dealer network it is actively putting in place. Mechanically, the C Type used the running gear of the contemporary XK120 sports car (the C stands for ‘competition’). The twin-cam, six cylinder engine was tuned to around 153 kW rather than the 134 kW of the road car. The custom, tubular chassis and aluminum body-panels, along with the elimination of creature comforts, helped the car to shed nearly 454 kg compared to a comparable Jaguar road car. The later C-Types were more powerful, using triple twin-choke Weber carburettors and high-lift camshafts. They were also lighter and better braked, by means of all-round disc brakes. The Jaguar C-Type won the Le Mans 24 hours race at its first attempt in 1951, driven by Peter Walker and Peter Whitehead and in so doing, became the first car to win a major race using disc brakes. In 1952 Jaguar, worried by reports of the speed of the Mercedes-Benz 300SL , modified the aerodynamics to increase the top speed. However, this necessitated a rearrangement of the car’s cooling system, and subsequently all three entries retired due to overheating. In 1953, the car won again, in a lightened, more powerful configuration, driven by Duncan Hamilton and Tony Rolt. This victory marked the first time the race had been won at an average of over 100 mph (105.85 mph - 170.34 km/h, to be precise). 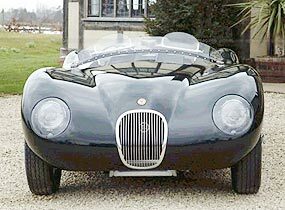 Proteus is actively seeking expressions of interest from international distributors, and has plans to extend the range to include SS100, XKSS, and D-Type Jaguars, Aston Martin DB3S and the glorious Mercedes Benz 300SLR. A friend dropped off the latest Classic and Sports Car magazine, and immediately I was envious of any enthusiast living in the UK. The plethora of vehicles available was just stunning. OK, OK, they are expensive in the main if you are looking for something like a genuine Ferrari GTO, but there are still loads of bargains for the impecunious enthusiast. In the February 2008 edition you can buy a Caterham 1700 Supersprint, 27,000 miles, 300 miles since a complete rebuild, and the lot for 12,000 pounds Sterling (that’s about 875,000 THB). Crying yet? 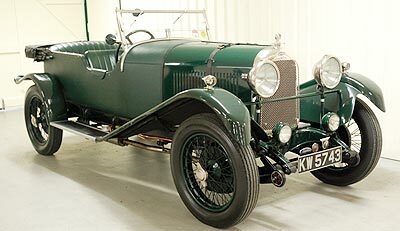 Or if Sir would like something a little older, there’s a 1925 Lagonda for 7,500 pounds Sterling, or perhaps wanting a little wind in the hair with an MGB for 2,700 pounds Sterling (and that is 189,000 THB). If you are a Jaguar fan, there’s an XJS V12 fixed head coupe, totally restored for - wait for it - 6,495 pounds Sterling, which is well under 500,000 THB. You can even buy a 1976 Rolls-Royce Silver Shadow for 8,950 pounds Sterling. I’ll wager you are crying by now!